The lady in my dream is my grandmother. I never knew her. She died in childbirth. In Japanese mythology she is considered to be an Ubume. A spirit that wonders around searching for her child. Ubume was originally the name for a small fish. With her smashing the fish in my dream she seemed to have a message for me. When she died giving birth to her fifth child at the age of 35 she had been a faithful Catholic. She had no knowledge of Japanese mythology, yet this dream was the first one in a dream – epos she wanted to share with me. I am walking in a town I do not know. All of a sudden there is a woman walking behind me with a baby. I turn around and look into her eyes. I am startled that her eyes have a very spiritual green-brown color. She has a baby in her arms and hands it over to me. I do not feel like taking it from her, my baby-days are over. She is persistent and pushes the baby in my arms. A very lovely chubby baby boy. My grandmother gave birth, the morning she died, August 22 1928, to a baby boy. My uncle. 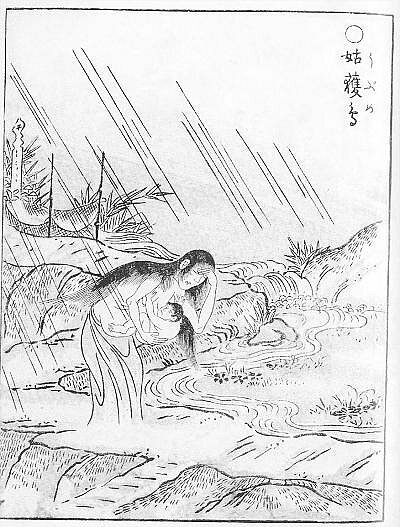 The Japanese folklore assumes a mother that dies in childbirth is not able to find rest untill her child is put into safe care. Did she smash the fish in the first dream to make way for the second one? The dreams were she gave her chubby baby boy a safe home? I am sitting at a dining table with a lot of people I know in my dream (but not in waking life). We are talking laughing and eating. Then the mood changes. Very strange, but something is happening at the energy level of the dream. And there she is again, at the head of the table. Those same mesmerizing green brown eyes.She says: "did you take care of him?" I don't know what to say but we exchange a lot of feelings in the look we share. Desperation, joy, the feeling of incompetence, anger at the brutality of the world, a feast of recognition that there is a woman so similar to me. Ancestry has this strange way of connecting themes, worries and sorrows. 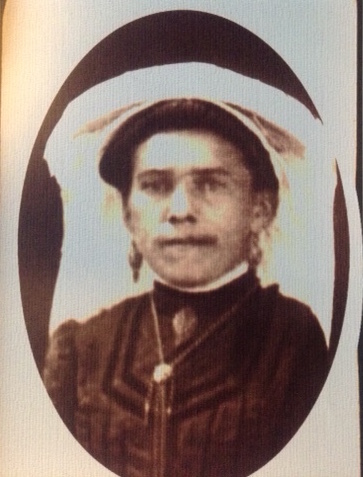 My grandmother had to work very hard, being pregnant every year and she did not see much of the world. Ancestry also can help you to realize you are not the only one that has to solve problems in this world. In her picture, the only picture I have ever seen from her, she wears her best hat and necklace. She looks a bit scared, as if the flash light from the camera startled her. The things my grandmother never told me… About children, about childbirth and its dangers. And maybe the stories about how she perceived the world. All those things she gave to me in that one look filled with emotions. It was magic, a form of communication I only know from my dreams. Do you like this article? Please share it with your friends. If you would like to support Mindfunda you can buy one of these gorgeous t-shirts.